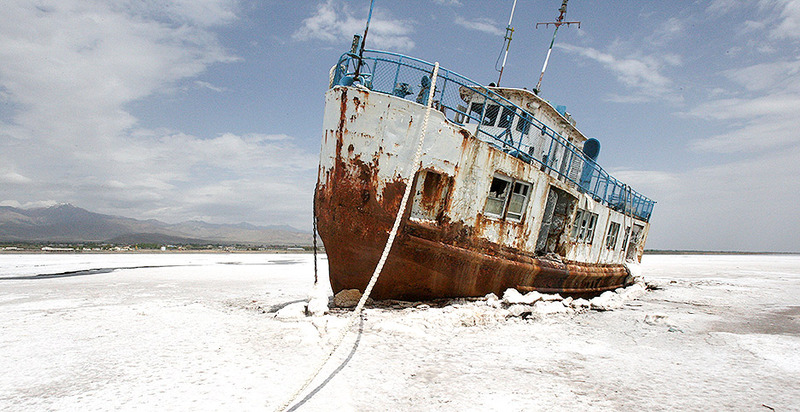 A severe drought, mismanaged water resources and dust storms diminished Iran's economy in recent years, according to experts who study the region. While the protests are largely driven by resistance to the country's hardline conservative government, such environmental factors might have contributed to the largest protests inside Iran in years. Former President Mahmoud Ahmadinejad understood that climate change and water mismanagement was ravaging family farms, and his government provided subsidies to families who struggled to put food on the table, said Amir Handjani, a senior fellow at the Atlantic Council's South Asia Center. When the current president, Hassan Rouhani, signaled that he would reduce those benefits, enraged Iranians across the nation's arid countryside joined the wave of protests. "You have climate change, shortage of water, they can't grow their crops, and now they're getting their cash handouts taken away," said Handjani. "It's a panoply of issues coming together at once." Among the sparks of activism are corruption, nepotism, rippling effects of low oil prices and sour reactions to the Trump administration's denunciations of Iran, said Barbara Slavin, director of the Future of Iran Initiative at the Atlantic Council. She said the role of climate change on the protests is "massive" and underreported by the media. The protests have largely sprung from provincial cities that climate refugees now call home, instead of the capital, Tehran. Those areas have traditionally been more conservative and less willing to speak out against the ayatollahs, she said. "Iran has had a drought for 14 years, and many of these people who come into these provincial cities and towns are there because they could not function as farmers anymore; there was no water for their farms," Slavin said. While the unrest in recent weeks was initially sparked by rising egg prices and anger over planned cuts to subsidies, one of Iran's biggest economic challenges has been a cycle of extreme droughts that started in the late 1990s, said Suzanne Maloney, a senior fellow at the Brookings Institution's Energy Security and Climate Initiative. "The drought has certainly impacted Iran's economy broadly, and it's impacted quality of life and living patterns, migration patterns around Iran quite considerably," she said. "It's an issue of huge political importance, one that factored into the presidential election last year, so it's certainly something I think one can say has had a role in shaping frustrations and driving some of the underlying grievances around the protests." By 2070, the Persian Gulf could experience a spike in heat waves that are hard for humans to survive, according to a Massachusetts Institute of Technology study published in 2015. The worst effects of such extremes could be curtailed with a drop in emissions from fossil fuels, a large percentage of which come from fossil fuels derived from the Middle East. This summer, Iran recorded one of the highest temperatures witnessed on Earth, at 128.7 degrees Fahrenheit. A series of man-made challenges, such as a rush to put dams on many of the country's primary rivers, also complicated water access problems. Reduced water supplies placed economic pressures on rural areas and smaller cities that have suffered some of the most severe environmental impacts, observers say. There is a growing sense of environmentalism in Iran, in response to the drought and deadly heat waves, said Kaveh Ehsani, a professor at DePaul University and an expert on Iranian politics. Extreme heat waves have hit a large percentage of impoverished Iranians in particular, he said. While middle- and upper-class people can afford air conditioners in a region where temperatures reach 110 degrees for several days in a row, many others cannot. They are forced to work in deadly temperatures or lose paid work hours, Ehsani said. In addition, increased desertification has caused enormous dust storms that engulf cities and freeze activity, sometimes killing people caught in them, he said. Environmental issues have brought some protesters into the streets, Ehsani said, in part because climate change is now seen as a contributor to inequity. Newscasts on the environment are potentially reinforcing Iranian views, since that topic is not generally censured by government officials. Environmental issues aren't seen through the same political lens as they are in the United States, he said. The Trump administration's retreat from the Paris climate agreement and its larger rejection of climate policy mean that Iranian citizens are increasingly blaming environmental problems on the United States, Ehsani said. "Environmentalism has become much more of a class issue, not just middle class anymore, but really affecting poor people," he said. "It's become a big part of everyday awareness. There are a lot of websites, a lot of activism around, and because it's not openly political and who can morally object to this or say it's Trump's doing, there has been a revolution about this in the past decade and a half." In recent years, there's been a recognition at the highest levels of the Iranian government that climate change poses an acute threat. Iran's Supreme Leader Ayatollah Ali Khamenei has called on the country to address climate change. In a 2015 letter, he wrote that Iran must "manage climate change and environment threats such as desertification, especially dust pollution [and] drought." The directive from the ayatollah and was addressed to President Rouhani, came just before world leaders met in Paris to craft the groundbreaking climate agreement. Such directives are typically used to set policy goals. Iran signed onto the Paris initiative and agreed to reduce its emissions 12 percent and to spend $5 billion on conservation efforts. Trump has praised the Iranian protesters on Twitter, but has been less clear about what the United States would do to support the rebellion. "The people of Iran are finally acting against the brutal and corrupt Iranian regime," Trump tweeted. "All of the money that President Obama so foolishly gave them went into terrorism and into their 'pockets.' The people have little food, big inflation and no human rights. The U.S. is watching!" Iran's increasingly desperate situation is an opportunity for the United States to help the Islamic republic address its ecological challenges, said Slavin of the Atlantic Council. Moving away from climate investment could compound those challenges, she said. "If the United States really cared about the welfare of the Iranian people, it would allow organizations like the U.N. environmental program to make loans to Iran, to provide expertise to Iran to help them with these issues," Slavin said. "Instead, our sanctions forbid this kind of cooperation. We really should be thinking long-term. This affects Afghanistan; this affects other countries around Iran whose welfare we're concerned with."